We have an extensive range of crab-apple trees, with almost 40 different varieties available at the start of the season. Short of ploughing through each variety in our catalogue, is there a quick way to find the best crab-apple for your garden? Yes there is! The trick is to narrow down your requirements by deciding on the characteristics that are most important to you. There are essentially two kinds of crab-apple. 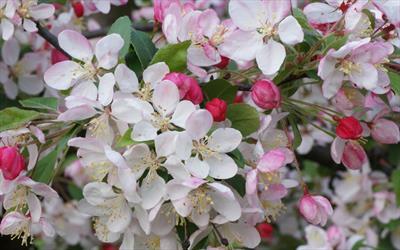 Most crab-apples have pink/white blossom and green leaves, and are similar to mainstream apples (although the profusion and duration of the blossom is usually much greater). In contrast, some crab-apples have bronze leaves (particularly in the spring), and these varieties also tend to have darker pink or purple blossom. Unlike flowering cherries, crab-apples generally don't have spectacular autumn leaf colours (with a few exceptions), and the main autumn interest is the coloured fruitlets. Crab-apple fruitlets are the main attraction in the autumn, and a good way to choose a crab-apple tree is to decide on what fruitlet colour you require. It is not quite as easy to categorise these colours as it is with the blossom colour, but broadly speaking there are three main fruit colours: yellow, orange/red, and crimson/red. 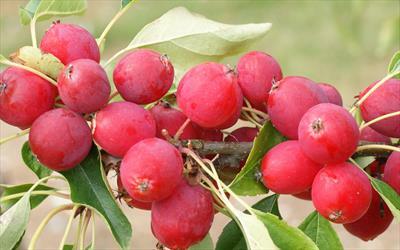 Crab-apples fall into two categories when it comes to fruit size - larger-fruited or small berry-like fruits. The larger-fruited forms are attractive because of the size and vividness of the fruitlets. The attraction of the smaller fruited forms lies in the way the tiny fruitlets are clustered together. It's also worth noting that the larger-fruited forms are generally the best for cooking with, as they are easier to handle and have more flesh. A useful characteristic to look out for with crab-apples is "persistence" of the fruitlets. Whilst most mainstream apples will fall to the ground when ripe, many crab-apple varieties hold on to their fruits - which means the tree continues to provide colour and interest into late autumn and early winter. These persistent fruitlets are often useful for encouraging the local birds and wildlife into your garden. The majority of crab-apples grow into medium-sized trees, typically 3m-4m tall (up to about 14ft), and with a clear stem of about 1m-1.5m - a form that is sometimes called a "half-standard". This is an attractive shape for most garden situations. A few crab-apples have a naturally weeping form, with long branches cascading to the ground. There are also some columnar varieties - these also tend to be a bit less vigorous than other varieties, and make a good choice if space is limited. Many crab-apples have a high pectin content to the fruitlets, making them ideal for crab-apple jelly. Nearly all crab-apples are excellent pollinators for mainstream apple varieties, because of the quantity and genetic compatibility of their blossom. For best results try to match the flowering season to the season of your apple trees - although crab-apples generally flower over a long period and thus cover several of the apple flowering groups. The RHS has given its Award of Garden Merit (AGM) to several crab-apple varieties, and these are a all good choices for both spring and autumn interest. We have our own favourites of course! Butterball - for its beautiful large yellow speckled fruits. Comtesse de Paris - for its bright yellow fruits, which stay on the tree well into autumn. Jelly King - its large orange/red fruits are great for cooking with. Laura - useful because it stays small and columnar, and for its bronze leaves and large crimson fruitlets (also good for jelly making). Pink Glow - early flowering, and early fruiting. The large fruits are a lovely pink/red colour, and this is also a very hardy tree. Red Sentinel - grows with an attractive balanced form, lots of white blossom and then a profusion of tiny scarlet persistent fruitlets. Louisa - a good weeping form, with dusky pink blossom. Profusion Improved - a good all-round crab-apple, with crimson pink blossom, and tiny dull red fruitlets which are very persistent.